The Simply Chic Baby Boutique is delighted to offer these adorable car baby boy Christmas pajamas by Mud Pie. These holiday pajamas are great to just lounge around in or for Christmas morning! With so many baby boy clothing brands available now, Mud Pie is a brand you can rely on. 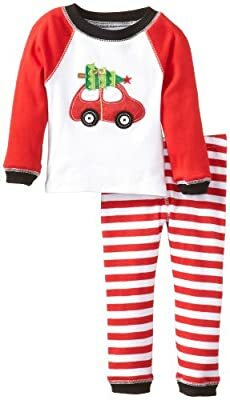 For this price, the Mud Pie's baby boys' holiday car pajama set is highly suggested and is a preferred choice for many individuals. Mud Pie has included some great touches which means you are going to love this set. Shop sweet stylish Christmas outfits for toddlers and babies at discount prices for all your baby clothing needs.